Because the Protecting Americans from Tax Hikes (PATH) Act of 2015, which gave federal tax credits on select energy-efficient products, has been reinstated for 2016, certain home improvement products (including some window treatments) are eligible. Talk to a trained consultant here at Blinds & Designs serving San Francisco and Marin County, CA to learn how you can see the products in action. How Do I Get a Tax Credit When I Buy Eligible Shades? Duette® Architella® honeycomb shades and Alustra® Duette® Architella® honeycomb shades of certain sizes with qualifying fabrics and lifting systems that are inside-mounted over a double-glazed window. Qualifying products are eligible for a tax credit of 10% of the cost (excluding sales tax and measuring and installation charges), up to $500 in total during the 2016 tax year. $500 is the maximum combined total amount that can be claimed for all purchases of qualifying energy-efficient products placed in service during this period. This is subject to reduction in the amount of Section 25C tax credits taken in prior years. Existing homes (not new construction) only may claim the credit. The tax credit is subject to a lifetime limitation of $500. 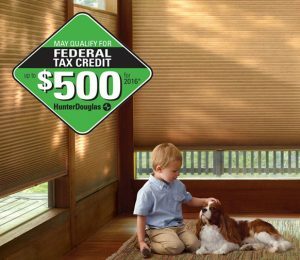 For specific details and restrictions, refer to the Manufacturer’s Certification Statements for each product at www.hunterdouglas.com/taxcredit. The most energy-efficient window covering on the market today is the Hunter Douglas Duette Architella honeycomb shade. This unique shade has a cell-within-a-cell construction, which helps save you money on your energy bill. It acts as insulation to help maintain a consistent temperature inside in the winter, and it reduces solar heat gain from the sun in the summer, allowing you to keep your environment cool and comfortable. Blinds & Designs offers a full line of quality window treatments to homeowners and commercial clients throughout the San Francisco and Marin County areas, including Novato, Point Reyes Station, San Anselmo, San Quentin, San Rafael, Burlingame, Hillsborough, Atherton, and Los Altos. With an ongoing commitment to high quality products and exceptional service, we’ve been serving our communities for over 14 years. Stop by our showrooms in San Francisco or Tiburon to see a variety of motorization displays in our showroom or call 415-921-4212 for more information.